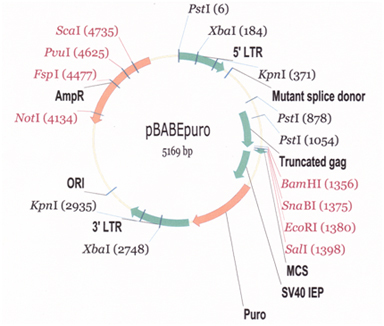 pBABE-Puro Retroviral Expression Vector | Cell Biolabs, Inc.
Jiang, J. et al. (2016). Overexpression of microRNA-21 strengthens stem cell-like characteristics in a hepatocellular carcinoma cell line. World J. Surg. Onc. 14: 278. Fulcher, L.J. et al. (2016). An affinity-directed protein missile system for targeted proteolysis. Open Biol. 10.1098/rsob.160255. Na, H. N. et al. (2016). E4orf1 enhances glucose uptake independent of proximal insulin signaling. PLoS One. 11:e0161275. Kohda, A. et al. (2016). The nuclear protein IκBζ forms a transcriptionally active complex with nuclear factor-κB (NF-κB) p50 and Lcn2 promoter via the N-and C-terminal ankyrin repeat motifs. J Biol Chem. doi:10.1074/jbc.M116.719302. Mathur, P. S. et al. (2016). Kinase-dependent and-independent roles for PTK6 in colon cancer. Mol Cancer Res. doi:10.1158/1541-7786.MCR-15-0450. Challita-Eid, P. M. et al. (2016). Enfortumab vedotin antibody–drug conjugate targeting nectin-4 is a highly potent therapeutic agent in multiple preclinical cancer models. Cancer Res. 76:3003-3013. Verhoeven, R. J. et al. (2016). NF-κB signaling regulates expression of Epstein-Barr virus BART microRNAs and long noncoding RNAs in nasopharyngeal carcinoma. J Virol. doi:10.1128/JVI.00613-16. Endo, S. et al. (2016). TEX101, a glycoprotein essential for sperm fertility, is required for stable expression of Ly6k on testicular germ cells. Sci Rep. doi:10.1038/srep23616. Hegde, V. et al. (2015). An Adenovirus-derived protein: A novel candidate for anti-diabetic drug development. Biochimie. doi:10.1016/j.biochi.2015.12.002. Rai, R. et al. (2015). Arginyltransferase suppresses cell tumorigenic potential and inversely correlates with metastases in human cancers. Oncogene. doi:10.1038/onc.2015.473. Matveeva, E. A. et al. (2015). Vimentin is involved in regulation of mitochondrial motility and membrane potential by Rac1. Biol Open. doi: 10.1242/bio.011874. Chakroun, I. et al. (2015). Genome-wide association between Six4, MyoD and the histone demethylase Utx during myogenesis. FASEB J. doi:10.1096/fj.15-277053. Wei, M. et al. (2015). The over-expression of aquaporin-1 alters erythroid gene expression in human erythroleukemia K562 cells. Tumour Biol. 36:1-12. Hansen, M. T. et al. (2015). A link between inflammation and metastasis: serum amyloid A1 and A3 induce metastasis, and are targets of metastasis-inducing S100A4. Oncogene. 34:424-435. Jiao, H. K. et al. (2015). Prognostic significance of Cbx4 expression and its beneficial effect for transarterial chemoembolization in hepatocellular carcinoma. Cell Death Disease. 6:e1689. Tomasovic, A. et al. (2015). Sestrin 2 regulates PDGF receptor beta (PDGFRβ) expression by modulating proteasomal and Nrf2 transcription factor functions. J Biol Chem. doi:10.1074/jbc.M114.632133. Diep, C. M. et al. (2015). Retroviral expression of human cystatin genes in HeLa cells. Methods Mol Bio.1249:121-131. Abdel Khalek, W. et al. (2014). SIRT3, a mitochondrial NAD+-dependent deacetylase, is involved in the regulation of myoblast differentiation. PLoS One. 9:e114388. Lian, P. et al. (2014). Loss of polycystin-1 inhibits Bicc1 expression during mouse development. PLoS One. 9:e88816. Mei, Z. et al. (2014). Polycomb chromobox 4 enhances migration and pulmonary metastasis of hepatocellular carcinoma cell line MHCC97L. Sci China Life Sci. 57:610-617. Ramos-Montoya, A. et al. (2014). HES6 Drives a Critical AR Transcriptional Programme to Induce Castration-Resistant Prostate Cancer Through Activation of an E2F1-Mediated Cell Cycle Network. EMBO Mol Med. 6:651-661. Pagnon, J. et al. (2012). Identification and Functional Characterization of Protein Kinase A Phosphorylation Sites in the Major Lipolytic Protein, Adipose Triglyceride Lipase. Endocrinology. 153:4278-4289. Zheng,Yu et al. (2012). Protein-Tyrosine Kinase 6 Promotes Peripheral Adhesion Complex Formation and Cell Migration by Phosphorylating p130 CRK-associated Substrate. J. Biol. Chem. 287:148-158. Jeong, H. et al. (2010). TAZ as a Novel Enhancer of MyoD-Mediated Myogenic Differentiation. FASEB J. 10.1096/fj.09-151324.